This engraving appeared in the Graphic, a British newspaper published in 1889. It was the first daily-illustrated newspaper. 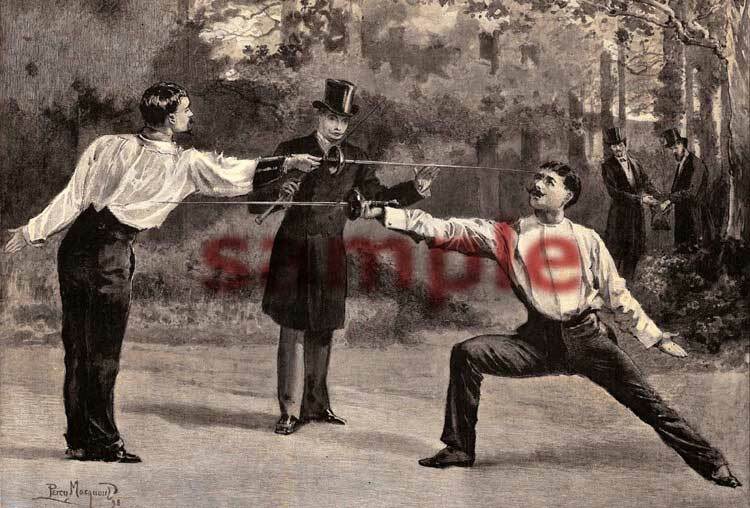 This illustration, published on January 7th, 1899, is the last of a series of six engravings on the history of dueling with swords. This drawing depicts a “stop” hit by rassemblement which is counter offensive technique used to counter attack as the adversary’s lunges. It is executed by extending the sword arm, directing the point of the sword at the adversary’s face while bending slightly at the waist and withdrawing the lead foot to bring the heels of both feet together forming a right angle thus bringing the body back away from the adversary's on coming point. Properly executed, the adversary will be struck by the point before his attack terminates.